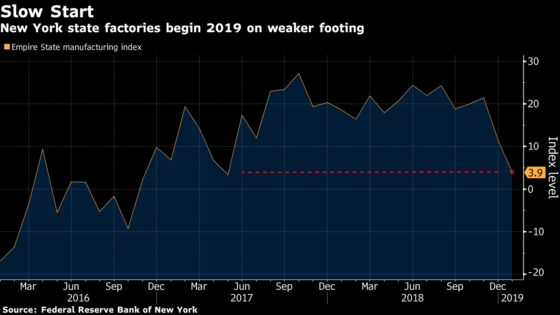 (Bloomberg) -- Manufacturers began 2019 on a weaker-than-expected footing as a regional Federal Reserve gauge fell to the lowest in more than a year, adding to signs of a slowing U.S. economy. The Empire State index, a survey of factories in New York state, dropped 7.6 points to 3.9 in January as measures of new orders and employment weakened. That’s the lowest since May 2017, a New York Fed report showed Tuesday. Expectations for business conditions six months ahead also declined to the lowest in almost three years, showing a souring outlook. Last month, all five regional Fed factory gauges posted cooler readings, the first time they’ve fallen in unison since May 2016. The Empire State index is the first of those regional surveys released for January and may be more closely watched than usual given key U.S. economic data are delayed because of the government shutdown. The next district report, from the Philadelphia Fed, is due for release Thursday. The latest New York Fed report adds to growing risks in the sector, and follows the biggest slump since 2008 in the Institute for Supply Management’s national manufacturing index. Some other measures of manufacturing have remained robust, with U.S. factories in December adding the most workers in a year.